"Three Strategic Reasons for Moving to Cloud ERP"
Moving to Cloud ERP system gives you a great avenue to rethink the way your company does business. Cloud-based ERP provides a platform ideal for global agility and empowers users to respond quickly in today’s global economy. 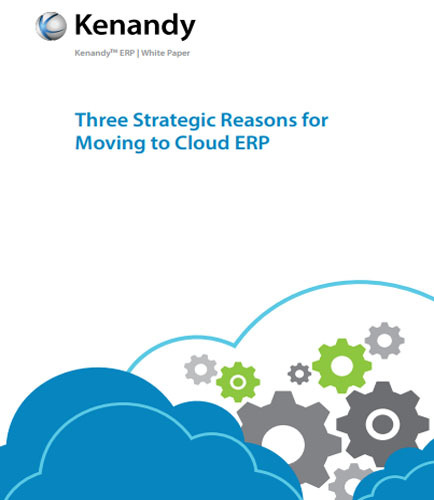 Why is it the Time to Rethink Your ERP System and move to cloud ERP? Having your ERP system on the cloud gives you entirely new ways to cut costs, be more productive and make your customers happy. With a cloud-based ERP system, you’re energizing an entire community of experts around the world — your business partners — to make your enterprise more efficient. Is Your Company Data Getting Lost in the Cloud? Data Loss Prevention in the cloud—Is your company data getting lost in the cloud? In the past, a large number of businesses were hesitant to adopt cloud, owing to concerns around data loss and security. Today, with a myriad of data loss prevention software, tools and best practices flooding the market, organizations are more open to the concept of cloud. The frequency of data loss in cloud storage is also at an all time low and enterprises are soon realizing that adopting the right cloud strategy can result in several benefits such as reduced cost and faster time to market. Do you want to leverage all the advantages of cloud technology safely? Would you like to detect data leakage through cloud computing? If Yes! Read this whitepaper on Data loss prevention that addresses the following questions: What is data corruption or loss in cloud computing? What actions to take when cloud data is lost? What are the ways to data leakage detection using cloud computing? What are the methods of preventing accidental loss of data? What is Cloud ERP ? Cloud ERP is using cloud-based solutions in the form of SaaS (Software-as-a-service), rather than on-premise systems, for enhancing an organizations overall efficiency.